Many of our goals for the new year include getting in or staying in shape. Have you heard about Capoeira (cap-oh-ay-duh)? It's a great way to get in shape without feeling like you are working out! 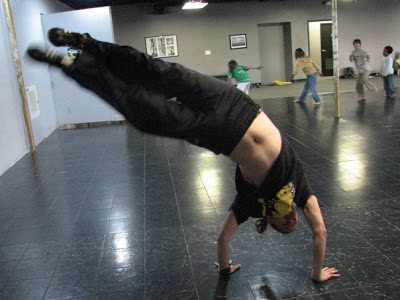 "Capoeira builds strength, flexibility and confidence," said Jay Clegg, Capoeira instructor. "You build multitasking skills through doing several things at the same time It's a fun way to get in shape without knowing you're getting in shape." Clegg started teaching Capoeira because he loves the art and wants to share it with as many people as he can. He has been doing capoeira since his early 20s, and has traveled the world learning and studying it. He has been to Kansas, California and even Brazil, where he spent a month practicing capoeira on the beach, and immersing himself in the Brazilian culture. "Jay is always willing to take extra time when you don't get a move or a sequence," said Russ Powell, one of Clegg's longtime capoeira students. "If he doesn't know something, he finds out and gets back with you." Not only does Capoiera help you physically, but mentally as well. Many capoeira students pick up and learn the Portuguese language from listening to the music and learning the Capoeira terms. A "roda" (pronounced hoda), is the circle in which capoeira is played in. Roda in Portuguese means circle or wheel. Ginga (pronounced jeen-ga), means to sway, and is the basic movement in capoeira. Capoeira in the media: Chances are that you have been exposed to capoeira without even knowing it. Besides being the martial art that breakdancing originated from, it has been featured in many movies, including Only The Strong starring Mark Dacascos, The Protector and Never Back Down. Roger Magala, one of the main dancers in the High School Musical Disney movies, is trained in capoeira and uses it in many of his dance moves. If you are a fan of the video game Tekken, you are familiar with Eddy Gordo. His martial art form in the game is capoeira. Upcoming Class: Jay Clegg is teaching a Capoeira class for 13 years and older through Granite Peaks at Hunter High School. The weekly class begins on January 10th, and is $29 for four sessions. You can register online, or call Granite Peaks at (385) 646-5439.